Explanation: Did the two most famous satellite galaxies of our Milky Way Galaxy once collide? No one knows for sure, but a detailed inspection of deep images like that featured here give an indication that they have. 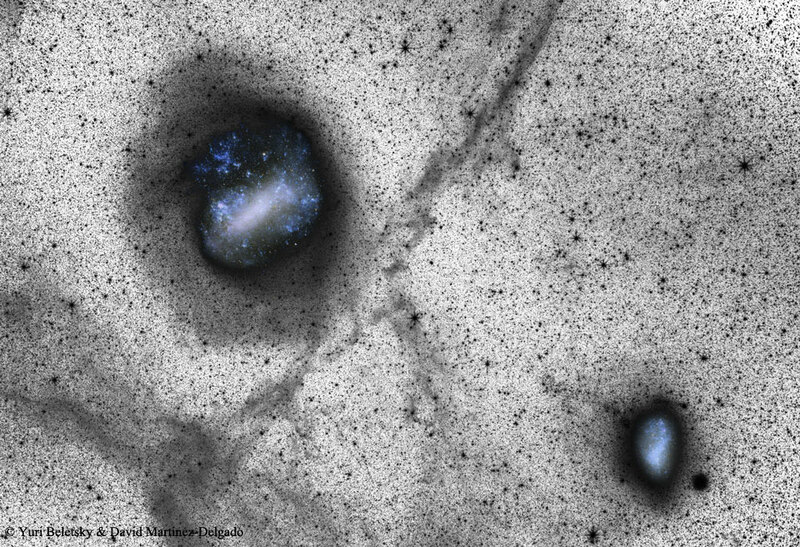 Pictured, the Large Magellanic Cloud (LMC) is on the top left and the Small Magellanic Cloud (SMC) is on the bottom right. The surrounding field is monochrome color-inverted to highlight faint star streams, shown in gray. Perhaps surprisingly, the featured research-grade image was compiled with small telescopes to cover the large angular field -- nearly 40 degrees across. Much of the faint nebulosity is Galactic Cirrus clouds of thin dust in our own Galaxy, but a faint stream of stars does appear to be extending from the SMC toward the LMC. Also, stars surrounding the LMC appear asymmetrically distributed, indicating in simulations that they could well have been pulled off gravitationally in one or more collisions. Both the LMC and the SMC are visible to the unaided eye in southern skies. Future telescopic observations and computer simulations are sure to continue in a continuing effort to better understand the history of our Milky Way and its surroundings.